I came across this cartoon this morning. The cartoon accompanies critical reflections on the DSM (Diagnostic and Statistical Manual of Mental Disorders) in an article that appeared on the Economist (published on 18th May). 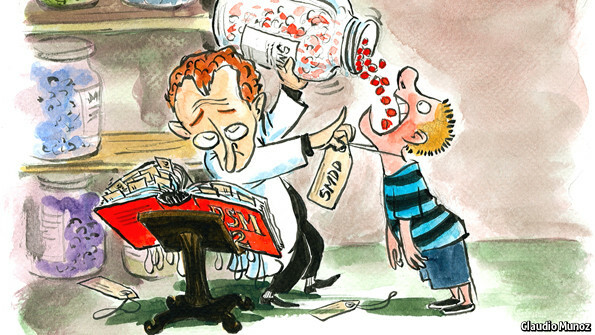 I thought the cartoon very pertinently portrays the main function performed by psychiatry nowadays, ie labeling (tagging) patients with a diagnosis and overdrugging them with ‘magic bullets’ of varying colour on the basis of the supposed scientific wisdom that the DSM, psychiatry’s Holly Bible, encapsulates. Economist’s article on the DSM that I found interesting and very succinct, is presented below. ‘THE human brain is the most complex object in the known universe. It contains 100 billion nerve cells. Considering how complex that is, it goes wrong remarkably rarely. But go wrong it sometimes does. Which is why, since 1952, the American Psychiatric Association has published its “Diagnostic and Statistical Manual of Mental Disorders”, the DSM. This book, the newest version of which will hit the shops on May 22nd, contains the association’s thinking on what constitutes a disorder of the mind. It is consulted not only by psychiatrists, but also by insurance firms, drug companies and anxious patients and parents—not only in America, but around the world. It has become the industry standard for defining what is and is not a mental illness, and thus who gets treated, and who pays for treatment. No other major branch of medicine has such a single text, with so much power over people’s lives. And that is worrying. Because in no other branch of medicine is the scientific reality underpinning the pronouncements of doctors so uncertain. This uncertainty flows from a profound ignorance about how brains actually work. Neuroscientists understand how nerve cells work. They also know which bits of the brain deal with vision, locomotion, language, memory and suchlike. But between these two anatomical levels all is darkness. Psychiatrists have thus had to use behaviour patterns as proxies for underlying problems. And what constitutes a pattern is too often a matter of opinion rather than a statistically rigorous fact. It is this desire to find and classify patterns which gives the DSM its power. By naming things it gives shape to the fledgling science. That is not a bad thing in principle. But in practice it has gone too far. The main criticisms are that it medicalises normal behaviour and that the strict categories of mental illness it creates are increasingly at odds with what research suggests is actually going on in the brain. Both criticisms are ultimately about names. The DSM gives names like “disruptive mood dysregulation disorder” to temper tantrums in children and “binge eating disorder” to those who tend to overeat. If these were mere labels, perhaps it would not matter (though in the area of mental health even a label can be damning). But diagnosis frequently leads to prescription, and lots of pills are thus being popped by people whose need to take them is, to say the least, questionable. The way the DSM classifies those who unquestionably are ill is also under attack. Schizophrenia, major depression and some forms of autism are disabling conditions that have long been considered separate diseases. But modern techniques of gene analysis and brain scanning are leading some researchers to wonder whether they really can be distinguished in the way that, say, various forms of leukaemia can be differentiated—for their biological underpinnings seem to overlap. Without a proper diagnosis, proper treatment is hard. Veneration of the DSM is also harmful in research. Thomas Insel, the head of America’s National Institute of Mental Health, has publicly encouraged scientists not to be constrained by its approach, lest it prevent them finding diagnoses and treatments. In terms of diagnosis, a few psychiatrists (including those who conducted the genetics and brain-scanning studies) now publicly point to the DSM’s deficiencies; yet the DSM’s definitions and certainties are too deeply ingrained for this criticism to have hit home. The full consequences of that will not be obvious for a long time. But the current over-reliance on one point of view in this extremely uncertain science is healthy neither for psychiatry, nor for those it treats’.